MANILA, Philippines - The Mines and Geosciences Bureau (MGB) of the Department of Environment and Natural Resources (DENR) has revealed at least 5 places in the country having sinkholes or hold the potential for sinkhole formation. In the past years, some mysterious sinkholes were found in several areas. A sinkhole is defined as a natural depression or hole in the surface topography caused by the karst processes or chemical dissolution of carbonate rocks. Sinkholes tend to form where there are large deposits of limestone, carbonate rock, and salt beds which are exposed to circulating ground water. As rock slowly dissolves, cave-like spaces develop under the land surface. Sinkholes may vary in size from 1 to 600 m (3.3 to 2,000 ft) both in diameter and depth, and vary in form. 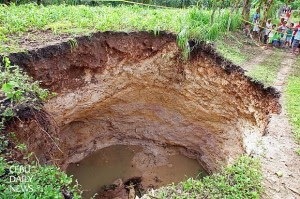 Sinkholes may be formed gradually or suddenly, and are found worldwide. If these lands that are susceptible to sinkhole formations have been used for development, there exists a large risk for both lose of property and human life. The MGB has mapped out areas in Visayas particularly in Bohol and Cebu where more sinkholes may possibly appear due to magnitude 7.2 earthquake that occured in October 2013. MGB Director Leo Jasareno also said Bohol is susceptible to sinkholes as the province's land composition is made mostly of limestone. 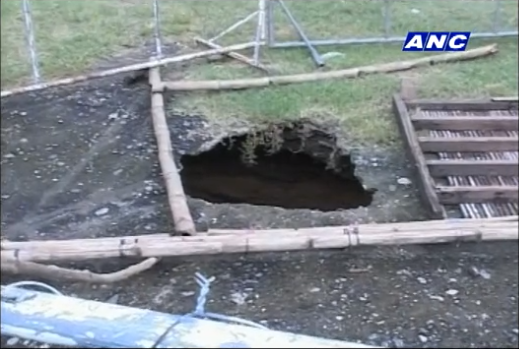 Jasareno pointed out Baguio City and Negros are also prone to sinkholes. 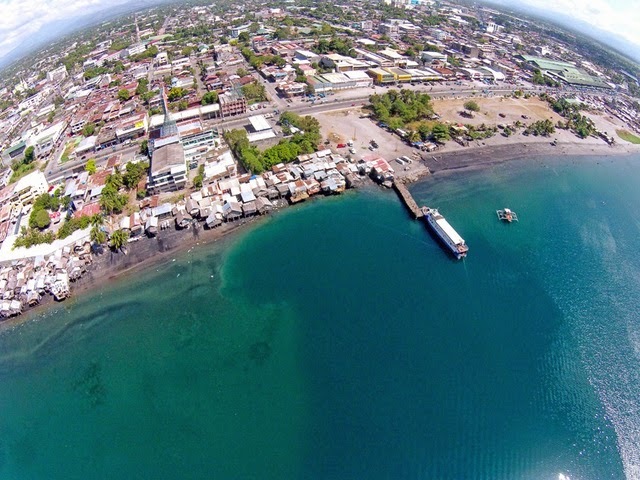 Recently, a sinkhole in General Santos City was also reported but local officials said it is a case of “coastal subsidence” and not the feared sinkhole. “Only the Mines and Geosciences Bureau (MGB) can declare if that is the sinkhole. But as of now, based on our assessments, it is a coastal subsidence,” Dr. Agripino Dacera Jr., CDRRMO action officer said. A new sinkhole in Sta. Fe town in Bantayan island was found in July last year that forced families in sitio Dapdap, Barangay Langub to relocate. Initially, the hole is two to three feet wide but grew wider according to residents. The sinkhole was about 40 feet wide and 4 feet deep. 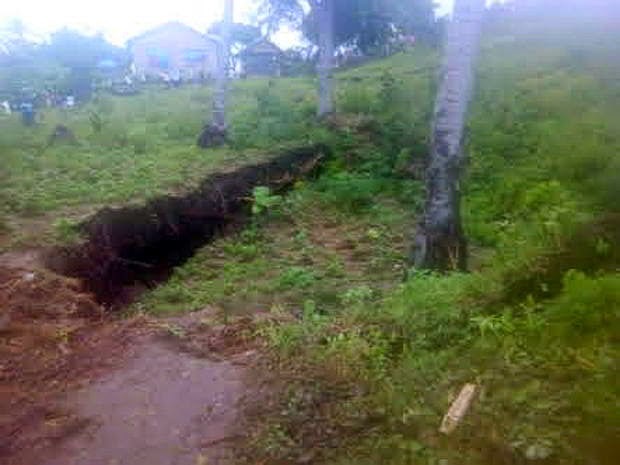 Reports said the sinkhole in Badian town continues to grow wider. When it was discovered late last year, it was only five meters wide and 10 meters deep. Geologists said could be attributed to the prolonged and intense rains and earthquake. Six people have reportedly fallen into a 12 feet deep sinkhole that suddenly appeared in the middle of a basketball court in Purok Jalandoni, Barangay Oringao in Kabankalan City, Negros Occidental in July lasy year. MGB said the hole may have been created by water flowing underground. Theu considered this as a geological hazard. Sinkholes are quite common in Baguio City, which also has at least seven known faults and numerous areas vulnerable to landslides. Landslides could be triggered by an earthquake or continuous rainfall, which can also cause sinkholes to wreak havoc. Because Baguio has one of the 10 highest daily rainfall records in the world and is visited by an average of five cyclones in a three-year period, landslides and sinkhole-related mishaps are expected. This and the presence of the faults—cracks or gaps in geological plates, the sudden movement of which causes earthquakes—are most probably why the World Bank lists Baguio as among the top seven risk-prone cities in Asia. But while Baguio officials are well aware of the delicate nature of their city, little has been done to discourage people from constructing homes and even buildings in areas where the ground is unstable. 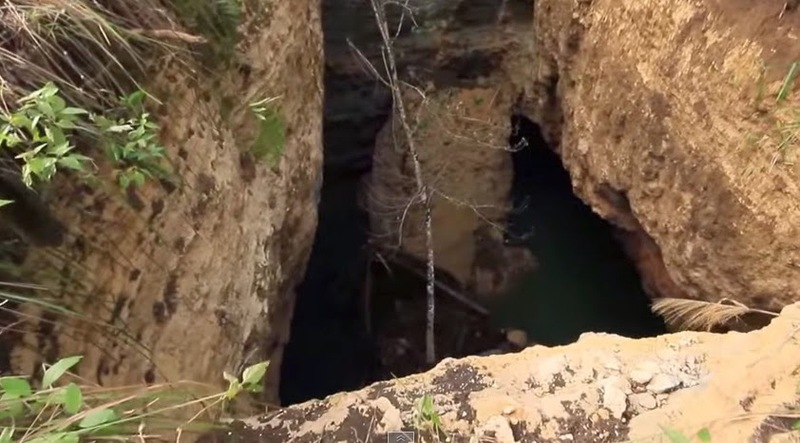 The deep hole found in Barangay Cambilan, Catigbian, Bohol according to Harlans Multimedia Production who has posted the video in Youtube said it was due to the 7.2 magnitude earthquake that struck the province in October 2013. Disaster officials are still puzzled on a deep hole suspected sinkhole at Purok Tinago, a community of informal settlers in Barangay South Dadiangas, General Santos City. Local TV stations have reported that it suddenly appeared in February this year. Local reports said the underwater hole continues to eat into the shores and gobble their homes. When they tried to measure the depth of the hole using a pumpboat anchor, only 20 dipa (fathoms) were left of the 350 fathoms of rope. While there are some limestones in Rizal and Tanay, Dr. Carlo Arcilla of the National Institute of Geological Sciences in U.P. Diliman said, most of them don't have buildings. He, however, downplays fears of sinkholes ever happening in Metro Manila, which sits on solid adobe rock. Sinkholes are the least to worry about in Metro Manila. Arcilla says more worrisome are active earthquake faults, including the Marikina Valley Fault, which extends from Montalban to Tagaytay.